The remains of South American independence hero Simon Bolivar have been exhumed in Venezuela to determine the cause of his death nearly 200 years ago. 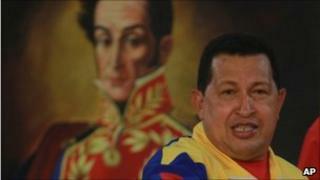 Venezuelan President Hugo Chavez ordered Bolivar's tomb be opened because he suspects he was murdered. Most accounts maintain Bolivar died from tuberculosis in Colombia in 1830. Mr Chavez announced the exhumation of his hero on Twitter, saying he "wept with emotion". "What impressive moments we have lived tonight. We have seen the bones of the Great Bolivar!" he tweeted from the national pantheon in Caracas. "That glorious skeleton must be Bolivar, because his flame can be felt. Bolivar lives!" he added. More than 50 experts including criminal investigators and forensic pathologists have been examining the remains to see if Bolivar was the victim of a conspiracy rather than disease, according to Venezuela's attorney-general, Luisa Ortega Diaz. "We have important discoveries that will be announced to the nation at the appropriate moment," she said. The exhumation comes as Colombia has accused Venezuela of tolerating the presence on its territory of the main Colombian leftist groups, the Farc and the ELN. Relations between Mr Chavez, an outspoken socialist, and the conservative government of Colombia have deteriorated in the last two years. Mr Chavez has rejected Colombia's accusations. Known as "the Liberator", Simon Bolivar led the 19th Century revolutionary war against Spain, winning independence for Venezuela and several other South American nations. The Venezuelan president claims him as the inspiration for his "Bolivarian" revolution, though some historians say Bolivar would not agree with Mr Chavez's socialist policies.